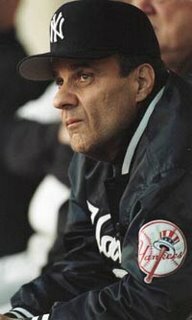 It took me a couple days to let the news sink in -- Joe Torre is no longer the manager of the New York Yankees. I couldn't bring myself to write about this until today. It was too painful. The last time the Yanks were under the guidance of somebody besides Torre, I was 10. He's been a fixture to me and to every Yankees fan since he joined the club. I've met fans who don't like Posada, who think Jeter's overrated, who want A-Rod gone, who hate the Giambi signing -- but I have never met a fan who hates Joe Torre. How can you? All he did in 12 years as manager was reach the playoffs each year, win 9 consecutive divisions and 10 overall as well as six pennants and four World Series titles. Say what you want about his outward appearance on TV, but the man could win ballgames and motivate a group of talented and overpaid middle-aged men like nobody in the game right now. I agree with what Torre seemed most ticked off about during his press conference -- the fact that the Yankees offered him incentives in his contract. First of all, a one-year deal meant that he'd wind up right back where he was at the end of this season in 2008. Second, the deal offered Torre an extra million for winning the division, then the pennant, and finally the Series. Look at his last 12 years!!!! Does this man really need incentives to WIN!?!?!? But there's more than a baseball loss here with the loss of Torre for us Yanks fans. There's this sentimental attachment rooted in the great memories. The '96 title. His brother's triumph over cancer, as well as his own. The tears he shed with Paul O'Neill over the loss of the right fielder's father after Paulie played in the deciding Game 4 of the '99 Series against Atlanta. The steady hand with which he calmed Steinbrenner over the years while digging the Yanks out of an early-season hole. The bond he shares with Jeter, with Mo, with Jorge, and with all those "true Yankees." And that bond he shared with us, the fans, who feel so completely cheated by Steinbrenner and the front office. To sum up how we feel, it's like dating a girl who everyone recognizes as a great catch. From the start, you've got nothing but great memories. But there was always this other guy (Steinbrenner) who gave your great catch fits from time to time. It never was a huge problem, but you couldn't help but think that eventually he'd be the reason you'd break up. The worst part is, you both want to get back together, but that other dude's influence is just too great. So you're left standing there with your jaw dropped and the wind knocked out of you feeling cheated. Long live the Joe Torre era. "To sum up how we feel, it's like dating a girl who everyone recognizes as a great catch. From the start, you've got nothing but great memories."